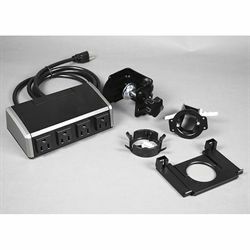 Designed to be installed in a standard grommet hole (or clamped to the edge of a desk), this dual AC/USB power center makes it easy to charge mobile devices and portable electronics without crawling on the floor. Surge-protected power outlets provide up to 15 amps of power while the two USB ports provide up to 1 amp... enough for a smartphone, MP3 player or Bluetooth headset. Charging cords and devices shown not included.